The power of taking people on a mystery journey. When you are only starting your online community, you can't offer a perfectly smooth experience or a large established base of people to network with. Your journey is only starting, and it is obvious. What to do? Take people on your journey! Over the last two months, we have made some (baby) steps towards promoting UNA.io, with mixed success. Some things didn't bring any benefit, some worked, and a few worked exceptionally well. As promised in the first "Operation 1 million real members" post, you get to know everything. Getting the first inbound links. When you open your site for the world to see, nobody is going to come just because it's there. We know our platform is the best system for building custom social websites, but the rest of world doesn't. Even though Google always finds a way to crawl new sites, it doesn't consider the content worthwhile until you have at least some external links pointing to the site. It is important to stay away from any "link building" schemes, paid links, link exchanges, and any other search engine "hacks." Modern algorithms will get you penalised heavily and for a long time for those. Instead, think about getting just a few links first from relevant resources with the aim of maintaining those references for years to come. For example, niche directories and review sites; there may be tens or hundreds of listings in your category, and only the top ones get any clicks, but that doesn't matter. At this stage, you just need to put your site on the map. Another source is the online external resources you control yourself or create for the project specifically. These are your blog, your company site, social profiles or pages, Twitter and Facebook pages, etc. We made sure to have a few links on those, too. Sure enough, Google liked it, and we now see an uptake in crawling activity, along with some organic, free search traffic coming in. Woohoo! Again, it's important to do all the linking in the most natural way possible. Use different link text that is not too keyword-heavy; write unique text in descriptions and accompanying posts and try to link to specific pages on your site; not just the homepage. Another way is to participate in other sites and occasionally refer to yours. You have to provide value and stay away from spamming, though. For example, if you're talking in a forum, make sure to answer questions and only bring up your site link when it's relevant to the discussion and the link itself is valuable in the context. I, for one, reply to questions on Quora sometimes, and it does pay off. 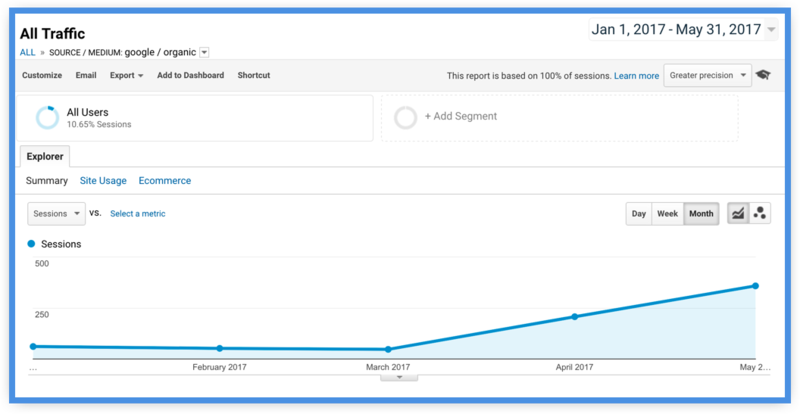 All in all, we had decent uptake in inbound traffic over April and May, with 760% jump in Google organic referrals and 400% direct referrals growth. Notably, some efforts don't seem to be paying off. 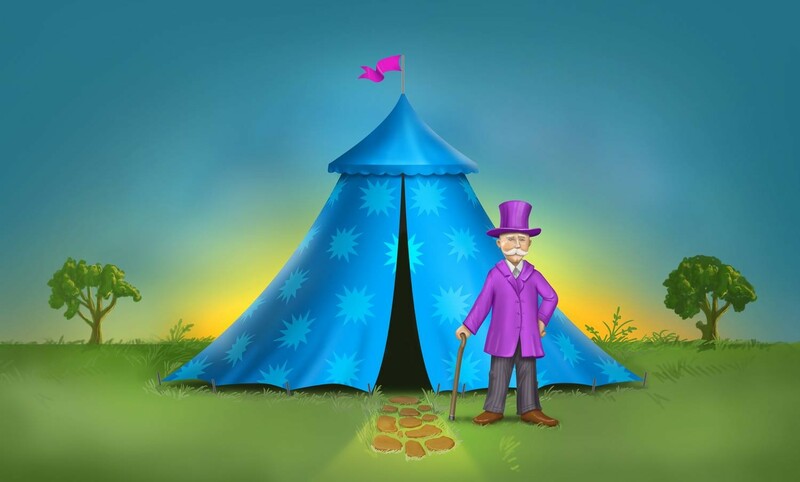 For example, we bought a sponsored listing at one directory site, but even with all the bells and whistles, there is hardly any traffic coming from there. On May 25th, our first real newsletter went out to 281 subscribers (not all UNA.io members choose to receive newsletters). While the list is too small to make a significant difference in site traffic, the engagement results are mind-blowing, making it the most successful newsletter we have ever sent by far, with a whopping 41.8% open rate and 16.8% click rate when the industry average open rate is about 15%! That's right. 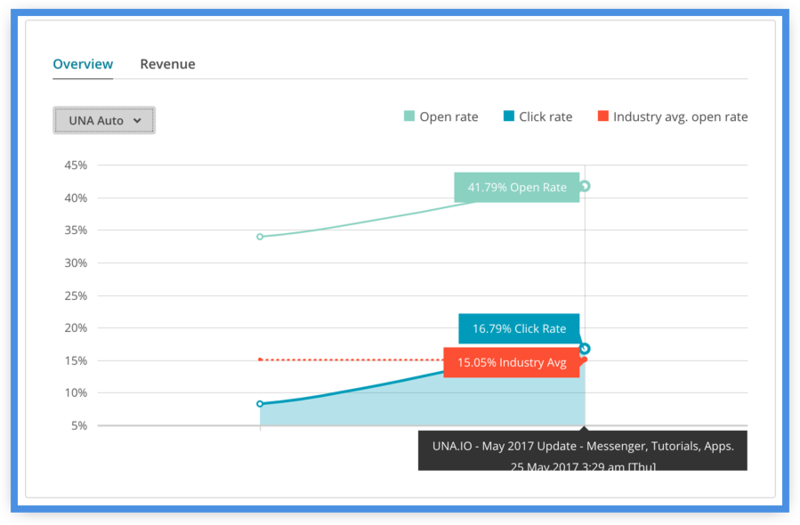 We got a click rate that beat the industry average open rate. We had two mailouts so far, both with excellent results, but the second one a fair bit better. There is a trick to it. Once we send out another newsletter to experiment a bit and run it with a larger list, I will post in detail about what helped with the engagement. There are some tricks, and they do make a huge difference, so stay tuned. As you probably know by now, we are testing a new, real-time Messenger app on UNA.io. A fully integrated messenger has been what is on the wishlist of many Boonex Dolphin webmasters for a long time, and we do plan to ship it out for Dolphin eventually. First; however, it will be released for UNA. On the 16th of May, we invited some of the most active Boonex.com members to try the new Messenger on UNA.io (note, that it's not ready for Dolphin yet, and it won't be for some time). We simply asked for feedback and invited people to join our journey. We knew that the Messenger experience is still very raw, unpredictable, and sketchy. Everyone could see this. But, you know what? It was a massive success. 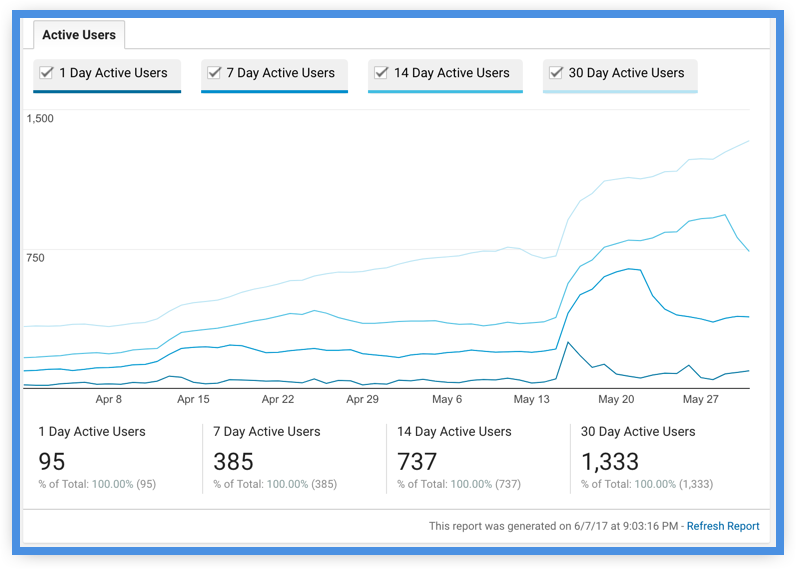 Not only did we gain over 200 new active site users and over 50 registrations in just one day, but we also received invaluable feedback, encouragement, and support from people that really care about what we do! Now, I firmly believe that a move like that is absolutely critical for a young community site. Start making something that solves problems and creates value for others, and invite people to participate in the journey of creation. Years later, you'll be looking back on this day as the day you met the most committed contributors and community leaders; the makers just like you. 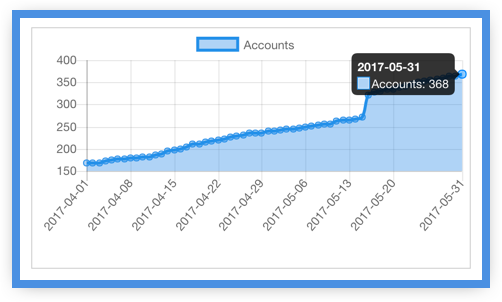 Over April and May community of UNA.io has grown from 168 to 368 accounts. Still far from a million, but getting there. I wish you much success Andrew, but I have to tell you, I just don't see anything to be excited about. If I had a million cancer cells and my doctor told me 2 months of chemo had wiped out 381 of them, I don't think I'd celebrate. I suspect that "most" of the people who opened and read and clicked through your email did it for the same reason I did, hoping that finally after 10 years or more since I first discovered it, dolphin might be getting a little closer to getting rid of the thousands of bugs and problems that plague it and becoming something that I could actually use. I'm truly sorry, if that bruises your ego, but it's just the truth about how I feel and most likely 90% of anyone who has ever tried to use dolphin must feel the same way. In the future I will be clicking through and checking things out but please don't get too excited, I'm just trying my best to salvage something from the 2 dolphin licenses I bought years ago. Also, I assume you know about all the bugs I encountered on UNA. I don't have the time or desire to be your "bug finder" but I will be checking back in hopes of everything you do becoming usable. Have a great day. Good luck. Thank you for the feedback, Vernon. Yes, 368 is not a big part of a million, but 368 real people paying attention to what we are doing is awesome nonetheless. It will take years to accelerate and achieve the goal, and they will be great years I am sure. I do appreciate your critique and welcome specific reports if possible. Over the last two years Dolphin has stabilised, since we are mostly focusing on service updates and UNA, while still fresh, actually does work very effectively and quite a few sites are already in production, including the UNA.io itself. There is also a large UNA update coming very soon addressing some known issues and bringing a lot of improvements. Perhaps that would make a better impression on you. Anyway, we are here, listening and whenever a specific serious problem is reported we address is promptly. My shared server installation of Dolphin is bug free, efficient, and secure. It is worth everything we paid for it and more. UNA will fit our (mobile) needs better so I am looking forward to the final adjustments. Keep up the good work, Andrew and Team! Take care of your customers and you'll eventually make it to the "tipping point." Much, much thanks today from the USA! Dolphin will live and will gradually be getting updates based on what works best in UNA. At some point it would become an UNA-based "solution" package. Great article Andrew. I'd like to know about that image for "Our journey to 1,000,000 members" showing account growth. Will we have a graph like that soon in the admin section? Yes, you'll have a few graphs, showing on Dashboard page for admins. It's coming in the next update. Cool, we are in desperate need for mobile on both platforms. The key as someone has already pointed out, is: "looking after customers" and I feel too much emphises is on "the product" and not getting the customer to "operational happiness" with their site. Dolphin BTW i found far more userfriendly, and i actually preferred the layout too! UNA, while no doubt has huge potential, its not ready for me, right now. I dont want to go on a journey with the reputation and risk of a an established business. I want to be sold a destination, now! A deatination softwear spa! Where my every whim is catered for. That ill pay for. For "mass market" you'll need to make it significently more user friendly, otherwise, i cant see it happening. Remember, you don't need to have everything right, day one. But have whatever you have released as simply to build / edit as possible. A 'White Label Model" would be far better i feel. Start beautiful, simple and small, no un-tested "whistels and bells, and require a top programmer!!! Best of luck with UNA in the years ahead.